Tweezing takes longer than waxing because you only remove one hair at a time. A good eyebrow shape can help frame your face and balance out your facial features; however, shaping your eyebrows for the first time can be confusing and intimidating. 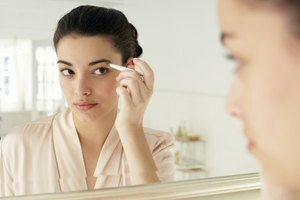 While you may have heard a lot about waxing, the idea of ripping out your brows may make you just a bit unsettled -- but there are many ways to remove excess eyebrow hair. No matter which option you choose, it's a good idea to see a licensed esthetician who can help you shape your brows the first time. 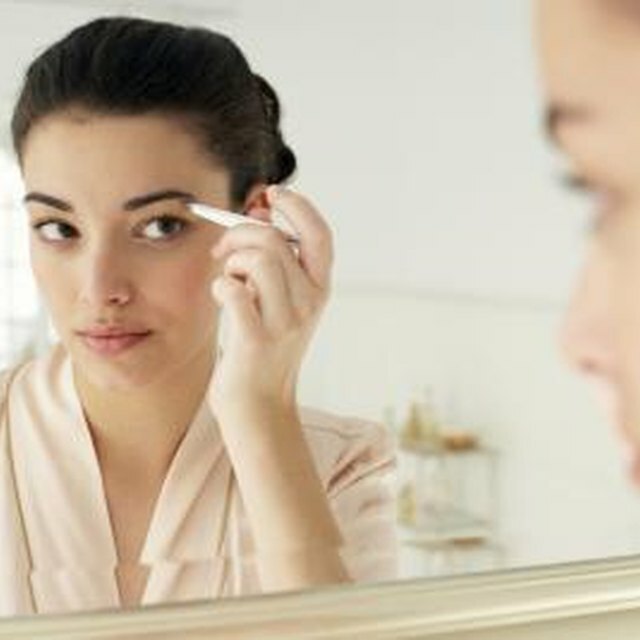 Tweezing is an inexpensive alternative to waxing because you can do it yourself and all you need is a pair of tweezers. If it's your first time doing your eyebrows, make an appointment with a licensed esthetician who can give you the perfect eyebrow shape to frame your face. 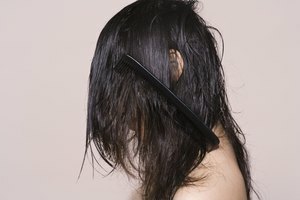 Ideally, tweezing removes hair from the root, but sometimes hair can break at the skin surface. 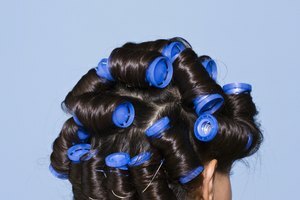 When the hair breaks, you are more likely to develop small bumps and ingrown hairs. Temporary redness may also follow tweezing. Tweezing can be time consuming because you only remove one hair at a time -- however, it is exactly this element that allows for greater precision. Although the shape you create from tweezing lasts several weeks, you must constantly maintain your tweezed eyebrows by plucking out hairs as they come in. 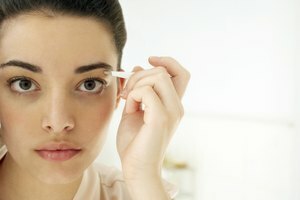 Threading is a hair-removal technique that involves using cotton thread to remove the entire hair and root from the follicle. Unlike tweezing, threading removes several hairs at once, making it a faster alternative to waxing; and, unlike waxing, threading doesn’t remove a layer of skin. Threading is also thought to be more precise than waxing, so you’re usually left with a clean, even eyebrow and no stray hairs, although the area may be red for a couple hours following your appointment. An eyebrow-threading session generally takes between five to 10 minutes, and full regrowth can take two to eight weeks. You will have to maintain your brow shape by getting your eyebrows redone every two weeks or so. Some beauty stores sell a small razor specially designed for shaving your eyebrows. 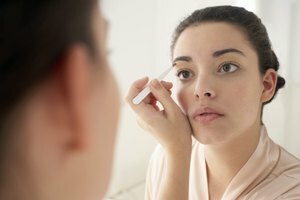 While shaving is quick and easy, it’s less precise than tweezing, threading and waxing, and it is entirely possible to accidentally remove entire parts of your eyebrow in the process. Although the razor is designed for your eyebrows, cutting the delicate skin under your eyebrows is also possible. Additionally, shaving only cuts hair at the skin’s surface and doesn’t remove hair from the root, so you can end up with a shadow underneath the skin. The results from shaving only last one to two days. Electrolysis is the only permanent hair-removal method. If you like the shape of your eyebrows and have no plans to change the shape in the future, electrolysis may be the hair-removal method for you. During electrolysis, a technician inserts a needle into the hair follicle and sends an electric current through the needle that destroys the hair bulb, preventing future hair growth. On the down side, electrolysis is expensive, time-consuming and painful, and it may cause dry skin, scabbing, scarring, inflammation or infection. Electrolysis is also considered to be permanent. Many people like to change their eyebrow shape and thickness with passing trends; even if you love your shape now, you may hate it in a couple of years -- so don't take lightly the decision to get electrolysis on your eyebrows. Boyers, Lindsay. "Alternatives to Waxing Eyebrows." Synonym, https://classroom.synonym.com/alternatives-waxing-eyebrows-14172.html. Accessed 23 April 2019.